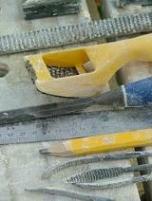 Riffler files are very small but very effective at detailed work within stone sculpture. 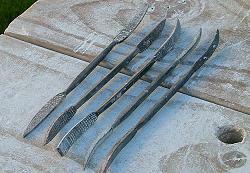 They are a great investment if you are serious about learning stone carving and are a must to add to your tool collection. I find them excellent when sculpting the human form. A good example of how effective they are is if you are working on a torso and you are trying to replicate the subtleties of muscle definition, or working on a small detailed area on the face such as the lips or eyelids. This little tool allows you to really highlight these areas with skill. That is not to say that they are not useful in larger sculptures. In fact they are equally just as handy when working on a much larger sculpture like an abstract where the stone is shaped into bends and twists. I find it easier to work with them in those situations instead of working with a rasp, as they allow me a measure of control in the process of carving away the stone and with what I am doing. Even if you are a beginner with no experience in sculpting they are still great to use because a small simple sculpture can have areas where attention for small and intricate details are necessary. 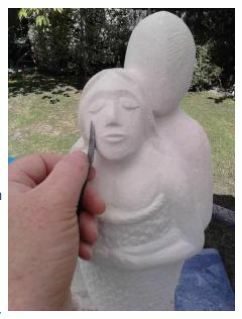 Therefore to develop your carving skills I suggest that you practice working with great little tool on your stone carving. You may be able to purchase a set locally but be aware that not all hardware outlets sell them. If you cannot find them then your best option is to try and purchase them over the net. Usually they are sold as a set but it is possible to buy just one on it its own from certain suppliers. As I found out, once you have tried them you will wonder how you managed to carve without them.